I am willing to do anything and work as hard as possible to help my team. I Have big size with good Hands. 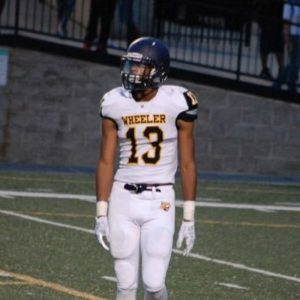 The 2019 recruit has outstanding length, and moves really well for a 6’5″ athlete. He plays basketball at Wheeler as well, and you see his good lateral quickness, especially when he is in zone coverage on defense. He shows really good athleticism moving up field, and hits his top speed really quickly. As a pass catcher he doesn’t have a ton of reps in terms of production. He also plays OLB at Wheeler and looks good flowing to the football. Very explosive in the hips, Pruitte shows a ton of upside and looks like a no-doubt P5 football player. His potential as a pass rusher on the outside can be elite, but we are extremely impressed with his ability to go out in coverage and defend the pass. He is a rare athlete to find, and we think he can be a big time player at the next level. He could easily grow into a TE too, adequate blocker at this point.